USU Eastern’s “The Eagle” newspaper staff won 17 awards, the most ever, at the Utah Press Association’s annual newspaper contest in Salt Lake City on April 14. 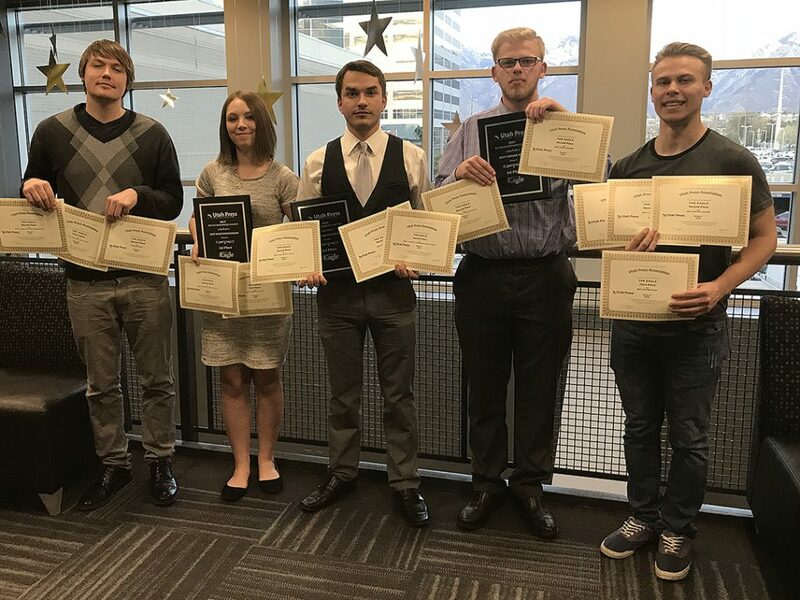 The staff competed against student newspapers from Utah State University, Weber State University, Brigham Young University and the University of Utah. The awards are given to newspapers excelling in 30 categories determined by professional press associations from throughout the United States. “The Eagle” competes in Group 5 of the competition which pits it against collegiate newspapers from Utah. It has the smallest circulation of all professional Utah newspapers. During Saturday night’s ceremony, the staff was awarded three first-place awards, 10 second-place awards and four third-place awards. First place plaques were won for best feature series, best news photo and best feature photo. Second place certificates were won for best editorial, best circulation promotion, best sports photograph, best use of ad color, best editor’s column, best digital breaking news story, best photo page, best advertising idea, best staff produced ad and best sports column. Third place certificates were won for best news series, best sports story, best feature story and special section. The UPA is an organization that represents 46 newspapers, according to its website. It is recognized as Utah’s oldest trade association having been founded on Dec. 17, 1983, by a collective of publishers. The UPA serves to annually recognize excellence in the state’s newspapers and present awards to industry leaders. Previous A green house inside a building on USUE campus?